“After many attempts by Friends of the Earth to delay this decision, the charity’s admission that all of the claims it made, that we complained about, were false should hopefully put a stop to it misleading the UK public on fracking,” said Francis Egan, chief executive of Cuadrilla. ….. The charity “agreed not to repeat the claims,” the Advertising Standards Authority (ASA) said. All pretty clear. As the BBC reports that the eco-worriers are not to be told that they are misleading the public. Donna Hume, a campaigner for the environmental charity, said it would “continue to campaign against fracking” because it was “inherently risky for the environment”. Ms Hume said Cuadrilla “started this process to distract from the real issues about fracking” and was trying to “shut down opposition”. “It hasn’t worked though. What’s happened instead is that the ASA has dropped the case without ruling,” she said. Last year fracking company Cuadrilla complained to the Advertising Standards Authority about one of our anti fracking leaflets. But after more than a year, the complaint has been closed without a ruling. The scientific evidence that fracking can cause harm to people and the environment keeps stacking up. Friends of the Earth is not alone in pointing out the risks of fracking, to the climate, to public health, of water contamination, and to the natural environment. ASA Chief Executive Guy Parker, took the unusual step of setting the record straight. But amidst the reports, the public comments by the parties involved and the social media chatter, there’s a risk that the facts become obscured. So let me be clear. We told Friends of the Earth that based on the evidence we’d seen, claims it made in its anti-fracking leaflet or claims with the same meaning cannot be repeated, and asked for an assurance that they wouldn’t be. Friends of the Earth gave us an assurance to that effect. Unless the evidence changes, that means it mustn’t repeat in ads claims about the effects of fracking on the health of local populations, drinking water or property prices. Friends of the Earth has said we “dropped the case”. That’s not an accurate reflection of what’s happened. We thoroughly investigated the complaints we received and closed the case on receipt of the above assurance. Because of that, we decided against publishing a formal ruling, but plainly that’s not the same thing as “dropping the case”. Crucially, the claims under the microscope mustn’t reappear in ads, unless the evidence changes. Dropped cases don’t have that outcome. The ASA, which tries to be impartial and objective, had to take the unusual statement to combat FoE deliberate misinformation. So what is the scientific evidence that FoE claim? This from the false statement that ASA was forced to rebut. I suggest readers actually read what is said. Hundreds of studies cannot identify, beyond reasonable doubt, that there is a significant large risk to human health. If any single study did establish this it would be world news. It is just hearsay, that would be dismissed by a criminal court in the UK. A suggestion is from what the PLOS-ONE Journal does not include in the submission criteria, that is normal in traditional journals – that submissions should have something novel to say about the subject area. As an online journal it does not have to pay its way by subscriptions, as authors usually have to pay a fee of $1495 prior to publication. But this still leaves the biggest piece of misinformation that FoE harps on about, but was not included in the ruling. Below is the BBC’s two pictures of the leaflet. It is the the issue of climate change that goes unchallenged. Yet it is the most pernicious and misleading claim of the lot. If fracking goes ahead in the UK it will make not a jot of difference. According to the EU EDGAR data the UK emitted just 1.1% of global GHG emissions in 2012. That proportion is falling principally because emissions are rising in other countries. It will continue to fall as emissions in developing countries rise, as those countries develop. That is China, India, the rest of South East Asia and 50+ African nations. These developing countries, which are exempt from any obligation to constrain emissions under the 1992 Rio Declaration, have 80% of the global population and accounted for over 100% of emissions growth between 1990 and 2012. I have summarized the EDGAR data below. So who does the FoE speak for when they say “We could trigger catastrophic global temperature increases if we burn shale in addition to other fossil fuels“? They do not speak for the USA, where shale gas has replaced coal, and where total emissions have reduced as a result, with real pollutants falling. There the bonus has been hundreds of thousands of extra jobs. They do not speak for China where half of the global increase (well 53%) in GHG emissions between 1990 and 2012 occurred. They cannot speak for Britain, as if it triggers massive falls in energy costs like in the USA (and geologically the North of England Bowland shale deposits look to be much deeper than the US deposits, so potentially cheaper to extract) then industry could be attracted back to the UK from countries like China with much higher emissions per unit of output. Even worse, F0E do not speak for the British people. In promoting renewables, they are encouraging higher energy prices, which have lead to increasing fuel poverty and increased winter deaths among the elderly. On the other hand the claims of climate catastrophism from human emissions look to be far fetched when this century global average temperature rises have stalled, when according to theory they should have increased at an accelerated rate. Ron Clutz has posted a good summary of the initial ruling, along with pointing to a blog run by retired minister Rev. Michael Roberts, who was one of the two private individuals (along with gas exploration company Cuadrilla) who made the complaint to ASA. The Rev Roberts has a very detailed post on the 4th January giving extensive background history of FoE’s misinformation campaign against shale gas exploration in the Fylde. There is one link I think they should amend. The post finishes with what I believe to be a true statement. The first reason is climate change. But rather than relate emissions to catastrophic global warming, they point to the how allowing development of fossil fuels appears in relation to Government commitments made in the Climate Change Act 2008 and the Paris Agreement. FoE presents their unbalanced case in much fuller detail in the mis-named Fracking Facts. 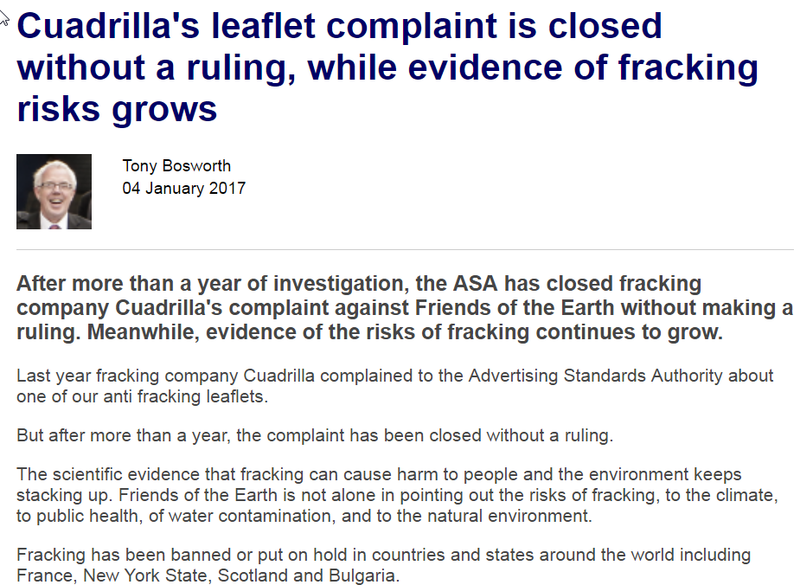 I have rechecked the post Cuadrilla’s leaflet complaint is closed without a ruling, while evidence of fracking risks grows, where Friends of the Earth activist Tony Bosworth makes the grossly misleading statement that ASA closed the case without a ruling. The claim is still there, but no acknowledgement of the undertaking that F0E made to ASA. F0E mislead the public in order to gain donations, and now tries to hide the information from its supporters by misinformation. Below, is a screenshot of the beginning of the article.